An excessive layer of thatch can cause problems for lawns. Thatch in lawns is often misunderstood; both its cause and control. Some lawns have serious thatch problems while others do not. 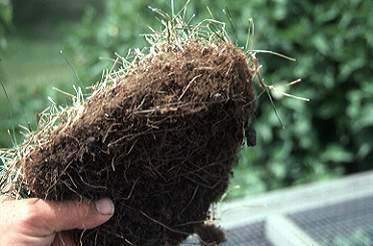 Thatch is a layer of living and dead organic matter that occurs between the green matter and the soil surface. Excessive thatch (over ½ inch thick) creates a favorable environment for pests and disease, an unfavorable growing environment for grass roots, and can interfere with some lawn care practices. The primary component of thatch is turfgrass stems and roots, and accumulates as these plant parts buildup faster than they breakdown. Thatch problems are due to a combination of biological, cultural, and environmental factors. As thatch levels accumulate to greater than ½ inch, lawn problems may begin and thatch needs to be controlled. Thatch may be torn out with a dethatcher or vertical mower, but will most likely return unless the cause is corrected. Mechanical dethatching is also very destructive to the lawn because roots are in thatch instead of soil, so plants remove easily. Overseeding is usually required afterwards. For this reason, it's best to tear out thatch in late August for optimum recovery and reseeding. Core aerification, followed by topdressing are two methods that will generally correct the reasons thatch is accumulating. Core aerifying machines will pull up small soil cores to the surface, which are left there to act like topdressing. The holes created help solve problems such as compaction or poor drainage. Topdressing is simply adding a thin layer(1/8 to 1/4 inch) of compatible black dirt high quality topsoil, or compost over the thatch, which adds microorganisms to help in breakdown.